April started with great news for local kayakers. 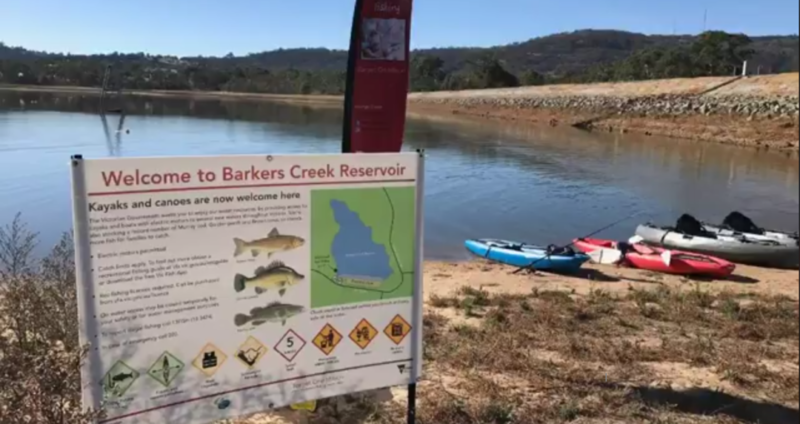 On the 11th Barkers Creek Reservoir which is located near the township of Bendigo was officially opened up to Kayaks, Canoes and boats with electric motors. Those electric motors will need to travel below 5 knots. This is all part of state government initiative to improve fishing in Victoria. Onsite for the occasion was local MP Maree Edwards representing the Coliban water systems. Barkers creek reservoir is a great location for fishing. Our review of fishing at this destination can be seen here. Its a terrific fishing destination for targeting redfin and trout. Barkers creek reservoir has also been a big winner of recent native fish stocking programs. In March this year it was stocked with a further 5,000 golden perch fingerlings ( yellow belly ). That’s 25,000 in total, so fishing in years to come will only get better and better. There is also plans to increase stocking of brown trout for winter fishing. Now that you will have access to reach deeper water via a kayak or Canoe the fishing opportunities are very exciting. Were already seeing reports from local anglers having great success on kayaks trolling hard body lures, flicking soft plastics, jigging vibes and blades. In years to come we will see anglers targeting yellas in this areas. The news will only get better as Tullaroop, Upper Coliban, Lauriston, Malmsbury and Hepburn to be opened aswell. You can follow this closely on the VFA website by using this weblink. This is state government target one million stage 2 in works. Don’t forget the state government are planning to stock 10 million fish per year by 2020. So hopefully we will see greatly improved fishing for local anglers and a big boost for fresh water fishing in our state.